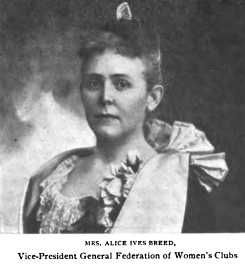 from <http://shimercollege.wikia.com/wiki/Alice_Breed>: Alice Ives Breed was a student at Shimer College during the Seminary period, graduating in 1871. She subsequently married Francis W. Breed, the owner of a shoemaking company in Lynn, Massachusetts. The Breeds lived in the Boston area, where she was active in the women's club movement; at different times their address was listed as Lynn, Boston or Cambridge. She was one of the 11 founding members of Lynn's North Shore Club, and its first president. She frequently toured the country speaking to other women's clubs. In 1896, she was elected as the vice-president of the nationwide Federation of Women's Clubs. In 1898, she was memorialized with a souvenir spoon. Breed converted to the Baha'i faith in the early 20th century, as did most of her children. Her daughter, Florence, married the eminent Baha'i Ali Kuli Khan in 1904, a marriage that "was praised by 'Abdu'l-Baha as the first marriage between East and West, a symbol of the unity taught by the Baha’i Faith."